Arrive on the ice planet Belsavis and enter the Eternity Vault….. if you dare…..
Now THIS is a Friday Update we can get excited about! Today’s update was a companion to the Taral V flashpoint video that was released by Gamespot yesterday. BioWare added a Flashpoints Overview page to the Game Systems tab, giving fans a peek at five flashpoints — two early game, two mid-game, and one end game (“End game”, they said “end game!”). They promise more flashpoints and more information to come. It's been confirmed! 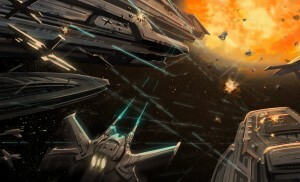 We will have space combat! Two chock-full Friday Updates and a Comic Con panel made for lots of discussion.